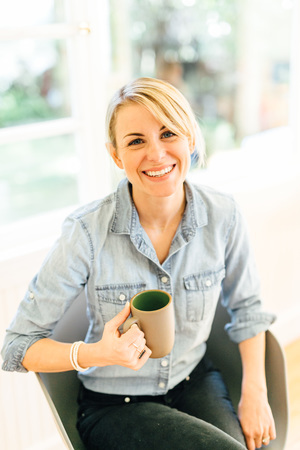 I’m Jess from forgivingmartha and I’m thrilled to have the opportunity to share a recipe with you today. And not just any recipe… a dessert made with chocolate and cream and butter. I’m quite certain that dessert doesn’t exist without butter. It just so happens that Jenna’s love-bucket, Adam, and I hail from the same small-town Texas area and have been friends for a long, long time. I’ve officially decided that Jenna and I are destined to be great friends, but it’s difficult with her living so far away which means I must first convince her to move Austin! I know life for Jenna in Northern California must be such a drag. As for myself, for the past five years, I’ve lived on the East Coast, right outside of New York City in Jersey (fist pump!) and have only recently transported myself to a life back in Texas. Austin is where it’s at now, yee-haw! 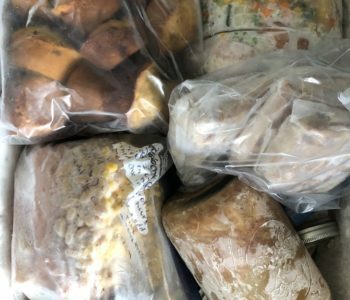 I’ve always been a bit overly food-centric and rightly so, as my mom and dad are both amazing and adventurous cooks which means I’ve been raised around daily, and often interesting, home-cooked meals. My own affinity for the kitchen grew post-college when cooking became more of a necessity of life. I was instantly in love with the creative aspect and challenge of creating and trying new things. For me, it’s a lifetime love affair that I enjoy more and more everyday. Now back to this dessert. Today I’d like to introduce you to the magical powers contained in a dessert that can only be described as heavenly. Chocolate? Check! Cream? Check! Pillowy-soft sugar cookies? Check! All three would be more than perfect alone, and when added together, we have a serious winning combination! Instead of a traditional vanilla pastry cream, I made a dense, yet lightly sweet, coconut cream filling that is the sticking power between two light and fluffy, cake-like cookies all topped with a rich, chocolaty ganache. And to whom do we owe thanks? Thanks be to Adam! You’re a peach. I’m now in touch with my new bff, Jenna, and all the wonderful devotees of ELR. 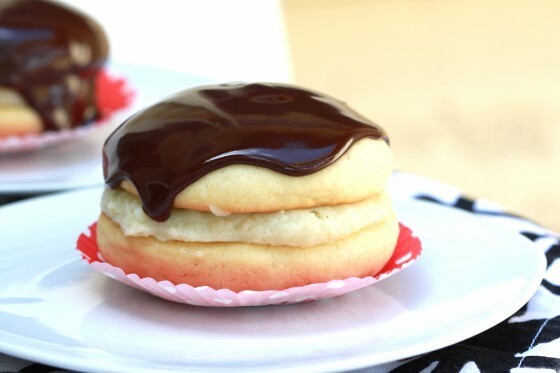 Now go on and enjoy some Boston Cream Pie Cookies! To make the cookies, whisk the flour, baking powder and salt together in a medium bowl. In the bowl of a stand mixer (fitted with the paddle attachment), cream the butter and sugar on medium speed until light and fluffy. Add the eggs, one at a time, beating well after each addition. Mix in the vanilla extract. With the mixer on low, add the flour mixture a little at a time, beating just until combined. Cover the bowl with plastic wrap and refrigerate the dough for 1 hour. Measure about 1/4 cup of dough for each cookie. Roll the dough into balls then place on the prepared cookie sheets and press to flatten just slightly (just a smidgen – they’ll spread as they bake), spacing them at least 2 inches apart (I baked 6 per sheet). Bake for 12-13 minutes, or until the edges of the cookies are just set. Don’t overbake or they won’t have the soft texture you want. Transfer the baking sheets to wire racks and let the cookies cool on the sheets for about 5 minutes, then transfer them to the racks to cool completely. To prepare the filling, whisk yolks until smooth. Combine sugar, cornstarch and salt in a medium saucepan over medium heat. Slowly add coconut milk. Cook, stirring constantly, until mixture begins to thicken. Pour 1/3 coconut milk mixture into yolks, whisking constantly. Return mixture to saucepan; cook over medium heat, stirring often, until thick, for 4 minutes. Stir in vanilla extract. For the ganache, you should heat heavy cream in a saucepan over medium heat. Sir in corn syrup until thoroughly heated. Pour mixture into medium bowl and add chocolate chips; stir until chocolate is melted and smooth. Cool slightly.To assemble, scoop chilled cream on the flat side of a cookie and match with a similar-sized cookie to top. Pour ganache over the top and allow to set… or don’t. What a great guest post! These cookies look so good (who can resist chocolate and cream and butter?) and I’m excited to check out Jess’ blog! This is the best Boston Cream introduction I’ve ever received, Jess. Nice to meet you! You could not have said it better! Holy Smokes! I feel like I can smell its goodness through my computer screen! 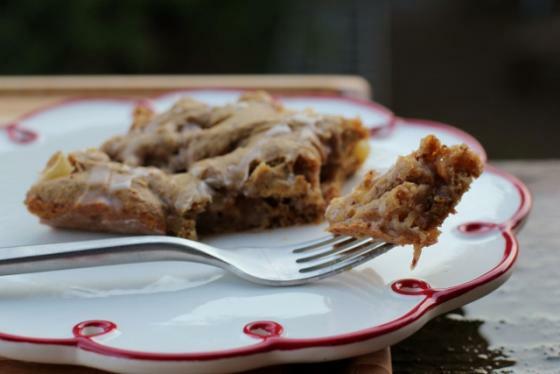 Fantastic guest post, love these cookies! O.M.G. you had me at “Boston Cream”!! I absolutely love Boston Cream Pies and these look so much more practical than making an entire cake! 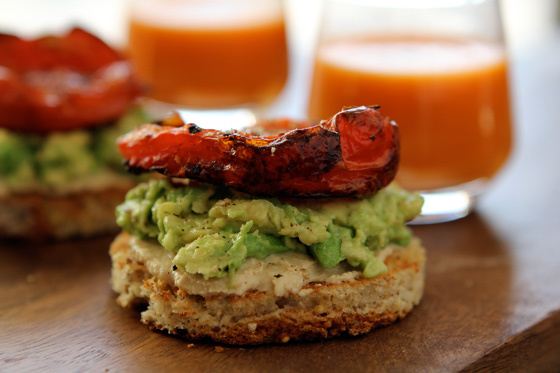 great recipe – i canNOT wait to try it! BAM!! YES!!! I want to skip work to stay home and make these!! Irony of the dietitian skipping work to bake cookies?? Wow – I have most of these ingredients…that is troubling because these are too tempting to make. I picked up a Boston Creme donut for the first time in years at a coffee shop the other day – and it was dry and stale – blech. These look quite the opposite! Did you know Adam in Austin? Small world if you both have cooking blogs too! You should sell these out of one of those food trucks on South Congress! I’d take this over a cupcake any day!! Three cheers for Boston cream pie cookies and another three for Jersey just outside NYC! Wow… this is the stuff my dreams are made of!! 🙂 Great recipe Jess! Adam’s got the hook-up haha- I want to eat my screen! These look unreal! Thank you, thank you, thank you! What an amazing idea. I shall make them the next time I need to make other people jealous of my baking skills. 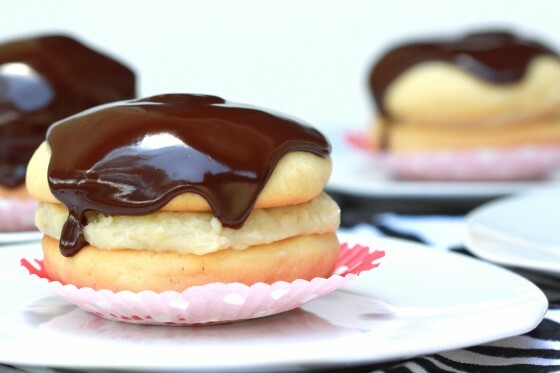 My boyfriend just looked over at the pictures and basically declared there was nothing better then boston cream pie and that we must make these cookies! Oh my golly – those are just too beautiful. I’m not sure I would feel right about eating it it’s such a work of art! Those cookies look delicious! And great photos, too! I wish I wasn’t so intimidated by baked goods! I’m rarely tempted by sweets, but I could really get down with these. I’m so happy to have found your blog, Jess! Having lived in both NorCal (SF) and Austin, I can say they are very much tied as my favorite US cities (minus Boston, of course!) The people in Austin are crazy nice, active and involved in their community, and (compared to NorCal and the East coast) it’s incredibly affordable. Enjoy your time there, and Jenna – you SHOULD move there! Who could not love these!? Boston creme pie is my favorite donut, hands down. I bet these cookies are amazing. OMG these better than amazing!! Wow, melt in your mouth good. These look amazing. Looks like I will be baking this weekend! These are so darling and I bet they are amazingly delicious! Wow those look great! And they are mini = cuteness. What a wonderful guest post!! Thanks for sharing, Jess. 🙂 These cookies look like little pillows of wonderful sweetness…I can’t wait to give them a try. wow these look just to die for. love the coconut cream idea! The pics are so stunning….. I love Boston cream pie as is, but with coconut cream?? It sounds even better! Thanks for sharing! These look amazing!!! Great guest post! These look insanely delicious. 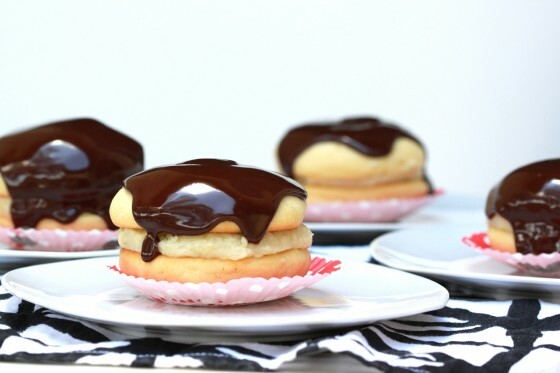 I was just saying yesterday how I can’t say no to boston cream pie donuts, and now I don’t think I’ll be able to say no to the cookies either. Definitely on my “to make” list! Yum. Oh wow–these look amazing!!!! I’m having some people over for dinner on Friday and these are definitely being made! Great recipe, Jess!! wow, amazing combination of ingredients. These cookies look AH-MAZING!! Gorgeous! I will be trying these oh yes I will. These look absolutely delicious! Thanks for the amazing guest post Jess :). Question: Do you use coconut milk from a can (from the ethnic food section) or from a carton (from the refrigerated section)? These look so amazing! I love Boston Cream Pie but have not had it recently. I think I must make these! Thanks for sharing! These look absolutely amazing. That ganache topping is calling my name! these look super amazing!! thank you for sharing such a great looking recipe!! Wow this sounds incredible! Gotta save this one! Those look amazing! Are you sure it only makes 7 cookies? That doesn’t seem right. Yum yum yum. Just saying’. beautiful photos! what a great idea. dying, these look sooo good! Thanks so much for sharing the recipe! Those are beautiful. Yes, the cookies are beautiful!!! 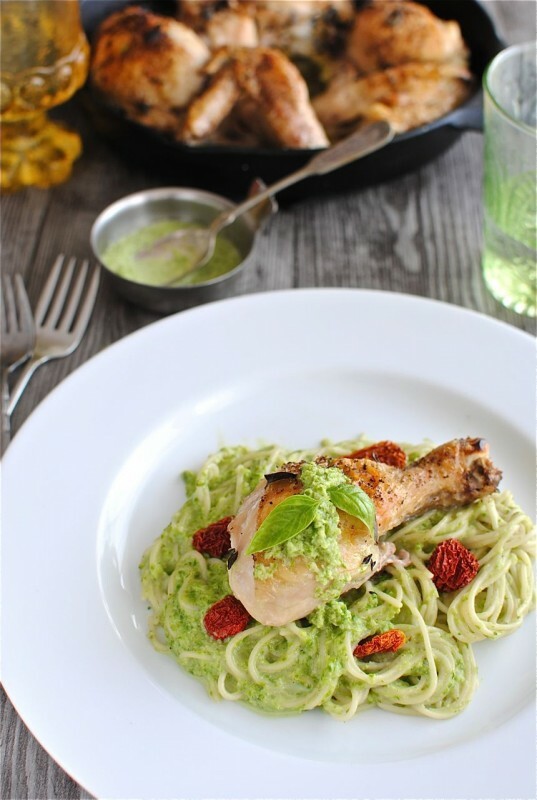 Your pictures are gorgeous and the recipe looks fantastic! That look DELICIOUS!! And it looks super easy too. 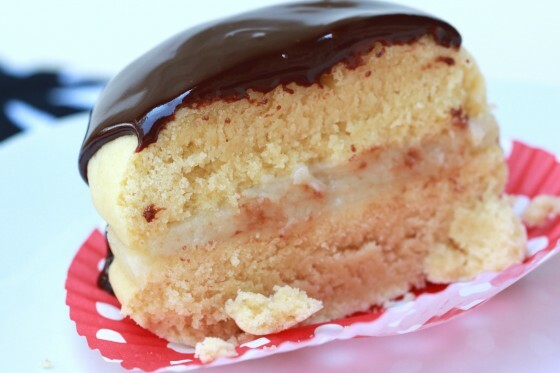 mmm…i love boston cream pies!! this is just the perfect bite sized pieces! These look absolutely amazing, I’m so going to have to try them, but I was wondering if something could be substituted for the coconut milk. I have tried but I just don’t have a taste for coconut. The consistency of the cream in the center of the cookies looks perfect. Any ideas on how to achieve that sans coconut? Thanks! I also was wondering what you could use in place of the coconut milk. These look great! 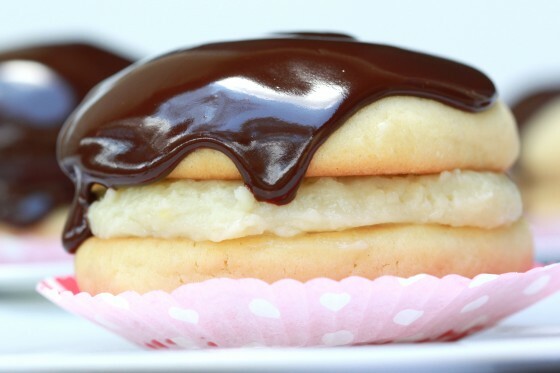 My doctor loves Boston Creme pie and I want to make these this week for his birthday. But I don’t know if he likes coconut. What else could you use? Just tried to make them! Mostly a success… My coconut cream turned into more of a custard. I used refrigerated coconut milk, which perhaps had something to do with it? No idea, but minus some consistency issues, they’re still quite tasty! LOVE the ganache and the cakey cookie!